The coalition of community, labor, academic, professional organizations and individuals supporting this forum came together to ensure that issues relating to public health and access to health care would become a key focus in the upcoming citywide elections. 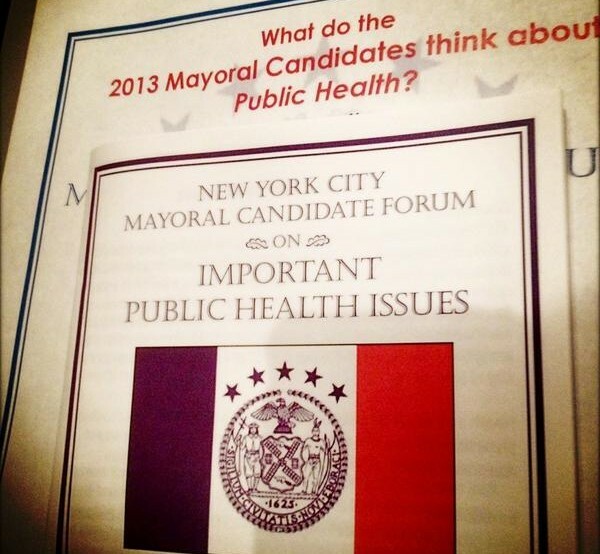 The topics discussed here reflect our concerns for the state of public health in the City of New York. We hope that this document will trigger, between now, January 16 and the November elections, a full airing of the positions on these issues by all of the candidates for Mayor of the City of New York (NYC). Health care issues are wide-ranging, complex, and personal. This document presents many concerns and policy recommendations – but for the sake of reasonable brevity, not all – advocated for by members of our coalition. As a group, we believe that there are long-standing weaknesses in the status of the public’s health in our city that remain to be addressed. Some of the progress made over the terms of the current administration should continue to be fostered, and hundreds of administrative decisions yet to be made by the next Mayor will have a profound effect on access to care, prevention, wellness, and other issues for so many New Yorkers. We hope anyone pursuing the opportunity to be Mayor of our nation’s greatest city will give attention to these issues commensurate with the impact his or her decisions will have on millions of people. We believe that community and labor have critical roles to play in improving health care services for all city neighborhoods, with a special emphasis on low-income, medically underserved groups, generations of immigrants, and communities of color.